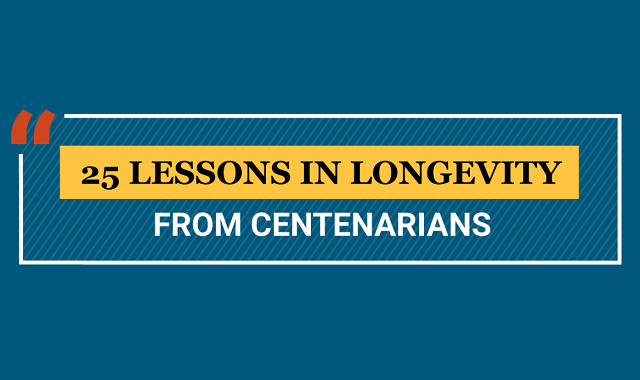 25 Lessons in Longevity from Centenarians #infographic ~ Visualistan '+g+"
The aging process is a fact of life many would rather do without. Getting old is a blessing and at times, a curse, but aging gracefully is far from impossible. Improvements in medicine and nutrition have led to increased life expectancies. In 2010, there were over 53,000 centenarians living in the U.S., this figure illuminates your 0.017 percent chance of living to 100. Even more rare, are the one in a thousand super centenarians who are lucky enough in longevity to celebrate their 110th birthday. These experts in lifespan likely have enough pearls of wisdom to thread a full necklace. We were interested to see if there were any consistencies or inconsistencies across the elders, that might lead to our own “age of enlightenment”.